Do you feel guilty because you aren’t getting more done? Chris Bailey wants to inspire you to get more productive to feel less guilty. In fact, he became a productivity enthusiast to minimize feelings of guilt and regret in his life. He started his productivity journey conducting experiments for a full year. He shared the results of those experiments in his first book, The Productivity Project. 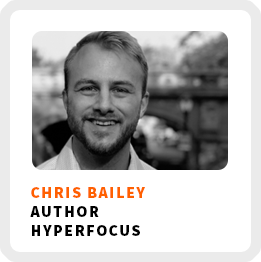 Recently, Chris released his second book, Hyperfocus to help you can reclaim your focus. You know what Chris does to regain his focus? He knits! Seriously! And I want to wish Chris a Happy Entrepreneur Birthday, which he’ll be celebrating soon on May 13th! Why Chris left college to experiment with productivity for a year instead of getting a job. Minimizing guilt and regret by getting more focused. The first action you need to take to start getting more focused. Chris shares his unique on how to discover your purpose. Core work activities + habits: 1) Speaking. 2) Writing. 3) Research. Ideal work environment: When he’s distraction-free, often later in the day after he’s meditated, and when he’s on a deadline. Biggest distraction: Wanting external validation from things like social media and email. Peak performance period: Usually between 10:00 am and 12:00 pm and then later on in the afternoon. Regains focus by: Noticing that he’s been distracted and then using a distractions blocker or putting his phone in another room. 90-day goal: To rest up from his book launch and to celebrate it. 1) Divide the tasks you do over the course of a day into categories like productive/unproductive or attractive/unattractive. 2) Stepping back from distractions as well as work that you do throughout the day to help reclaim your attention.